An affordable flipbook converter helps you super-charge your PDFs, creating customizable eBooks with 3D-look on Mac easily and quickly! ● Easy Conversion - Convert PDF to flashbook on Mac OS X system. ● Company branding and full style design - logo, background, tool bar, flip effect, etc. ● Various templates for design - 3D Panoramic, Float, Fresh, etc. 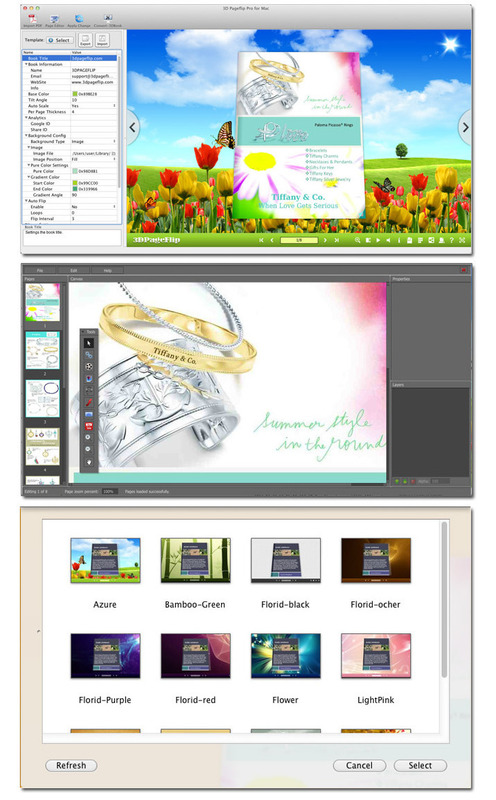 ● Multimedia Adding - embed 3D video, 3D object, flash, link, YouTube, audio, sound to create multimedia eBook on Mac. ● Diversified online and offline output formats - HTML, APP, for tablets and mobiles. ● Social media integration - spread and share your 3D flash page flip book worldwide. 3D PageFlip Professional for Mac, the most easiest to handle flipbook converter, enable to convert PDF files to realistic 3D flip book with multimedia content on Mac OS X system. It supports Mac users to create and publish their personalized Mac 3D flip Book, digital catalogs, company brochures, e-newspapers online and offline through HTML or APP output format. It also allows you to insert a dozens of multimedia objects to flipping page, including YouTube videos, SWF video, images, links, flash, buttons, etc. 1. Create 3D flipping book and show page turning effect. 2. Editing function for you to add vivid elements to flip book pages, including 3D object, 3D video, link, movies, pictures, sounds, flash(swf), button, Youtube and so on. 3. Define quality and size for imported PDF pages. 4. Select templates and create themes for 3D flash flipping book. 5. Design book title, flash buttons language, book information, tool bar color. 6. Enable Auto Flip with setting Flip Interval. 7. Provide two page formats for selecting. 8. Define page thickness, book auto scale for different size of browsers. 9. Set your own information for the online flip book, including book name, website address, Email and details info. It will be shown in the ‘About’ window. 10. Import your logo to show in the left corner of your flash flipping book. 11. Pre-set tilt angle while using the 3D page turning book. 12. Input a picture as your background or set it pure or gradient color freely. 13. Friendly for SEO purpose and Google Analytics. 14. Allow viewers to share with friends via Facebook, Twitter, iGoogle, etc, even more, AddThis platform for sharing is supported. 15. Several output formats for you to choose: HTML, APP. ● HTML enable to upload to a website as a online 3D page flip book (with title, keywords and description defined). ● APP setting title, icon and open window size. 1. Real book-like flash page flip book with page turning effect. 2. Read 3D Mac eBook with multimedia content: flash, music, video, button, link, sound and more. 3. Use navigational buttons or use mouse to drag page corner to turn pages. 4. Double-click or click zoom in/out button to zoom in or zoom out pages in multi-level. 5. View pages thumbnails and get a quick arrive to your targeted pages. 6. Make the 3D page flip book play by itself. 7. Adjust Tilt Angle or wheel mouse to change angle to get 3D effect. 8. View eBook detail information. 10. Open bookmark window to add bookmark as a tag. 11. Share with friends with the eBook. 12. Get the flipping book print with any pages you want. 13. Full screen to view eBook. 14. Open in the Browser to a specific page by adding a page index to your URL. (E.G.www.yourdomain.com/index.html?p=4).